Have you ever eaten no-bake cookies? The chocolate, peanut butter, oatmeal deliciousness? 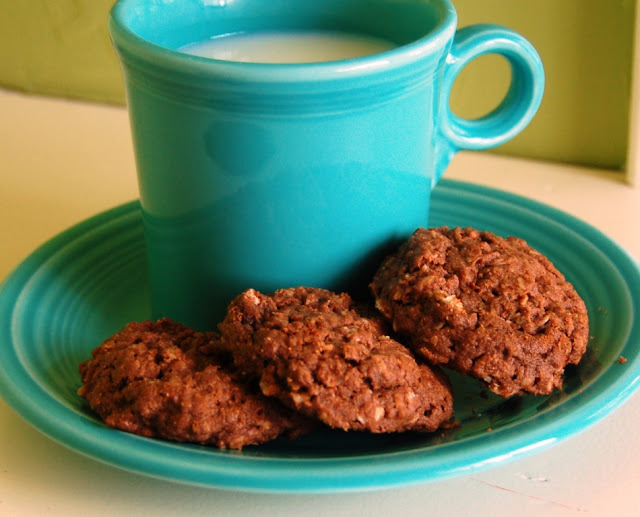 Recently though, I tweaked a recipe to make a cookie I think I might like even more; and while you do have to bake these cookies, they have the same sorts of no-bake flavors with a more classic chewy cookie texture. I'm officially hooked, and not just 'cause I'm hormonal and craving all things chocolate. Try 'em with a big glass of milk! Your thighs will thank you. Cream butter and sugars until fluffy, then beat in peanut butter, egg, and vanilla. Add dry ingredients, mix well. Stir in oats. Drop cookie dough by rounded tablespoonful (or cookie scoop) onto lightly greased pan. Bake for 10 minutes at 350°F -- don't overbake or the cookies will start to dry out. Store in tightly closed container, makes 20-24 cookies. One of my faves and it's been years since I've had these! YUM! yum! just popping over from TT&J! Yum! I love no bake cookies, but I never thought to bake them:) Great idea! Yup. I'm a new follower. Saw this recipe, then saw the "suggested posts" to several other delicious recipes. Can't wait to see more! Haha :) Me too, sure wish I wasn't on a 2-week sweets fast. I could really use one of these! And by one, I mean five. The cake must be brought by the waiters in the dining room still full, the bride and groom, each with its own right combined with the companion, using a silver knife decorated with a soft white satin bow, will make the first cut, after which offer the bride to the new husband and then to offer the first slice, the second to the mother-in-law, the third mother, the father and witnesses. At this point, completed the traditional rite of shots, the maid took the comfort food by taking a slice and the subsequent portions. Allergens are present in most comfort recipes This is the reason why people who have a low tolerance to certain foods need to be choosy especially with the bakeries where they buy cookies and desserts. If you are sensitive to gluten and other allergens in baked products, it is essential to find an allergen free bakery that can address your particular needs.